In this article we present an interview exploring the customer impact of Cryptyk’s enterprise security and cloud storage platform from the perspective of one of our early alliance partners: blockchain proponent and cyber security specialist Bob Bender. 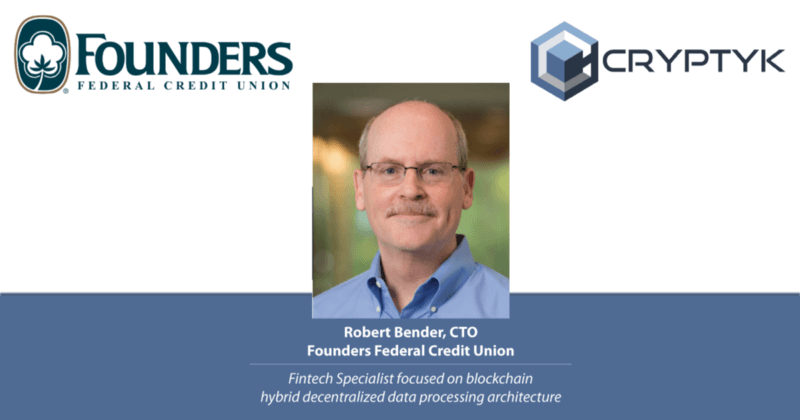 Bob is the Chief Technology Officer at Founders Federal Credit Union. He also has additional duties as their Fintech Specialist focused on blockchain hybrid decentralized data processing architecture. Furthermore, he is a charting founder and Advisory Board member of the National Credit Union — Information Sharing and Analysis Organization (NCU-ISAO), a voice well known in the cyber security conference space. He initially came into contact with our team at these tech conferences. Bob first became aware of Cryptyk during his active participation in security conferences where, a couple years ago, he ran into our co-founder and CTO Raghu Kotha. The two specialists talked technology, and eventually began discussing the evolving security needs of his organization. Bob recalls “[Raghu] said that Adam and him were working on this concept (Cryptyk).. and asked me ‘do our ideas make sense?’ and ‘how could you benefit from this?’ It just got more and more exciting as it came to a pilot version.” Bob became involved in the development of the first BETA platform, and is now confident that Cryptyk is approaching cyber security from a brand new angle, fresh and responsive for their customers in fintech. After his experience with the Cryptyk BETA, Bob feels that the platform can handle much of the heavy lifting to secure data for his team while maintaining a lightweight system footprint. Less obvious, he feels, is that it transforms the IT department’s role in an organization by arming them with a proactive set of tools for the first time. He described that the usual process for an IT team is to ‘protect, detect, respond, repair’, with emphasis on ‘respond and repair’. Traditionally the team waits for an attack to register, then rushes to allocate resources for damage control. With Cryptyk’s hybrid blockchain technology, there is a live, immutable ledger of all activity that facilitates instant monitoring and auditing of the system. “This allows real time tracking, which validates data security faster, then passes along the metrics to the team, C-level and Board. Everyone [in the company] is going to be on the same page as to how I manage that data and identify the return on our assets.” The IT department will always be a “cost center”, but it is Bob’s belief that Cryptyk will drive that investment lower and also affect costs associated with security in many other departments of an organization. This is the opinion Bob has of Cryptyk just from working on our BETA with our team. He expects the full enterprise Cryptyk platform to completely change the paradigm of IT’s role in an institution. The Department that is traditionally a ‘bottleneck’ for business owners can now help an enterprise evolve and grow. ..That’s the beauty of it, you’ve taken an IT Department that always seems to be in the middle with limited resources, getting pulled between keeping the lights on and keeping up with innovation in cybersecurity, and you’ve moved it to enabling the future to be measured and managed in a more meaningful way. It is now solving real business problems for our members and our employees. Here is a product built with security at the forefront, measured 24x7 and managed 365 days out of the year. All this can interrupt the current paradigm and be applied to an organization’s common strategic roadmap. Another component of Cryptyk is the cyber-security ecosystem built around SENTRY’s blockchain, and powered by the Cryptyk Token (CTK). The Cryptyk token will be primarily used to pay for our cloud storage and robust security services, which are set at a fixed price in US dollars. A reserve pool of the token, regulated by the non-profit Cryptyk Foundation, will also be used to incentivize participation of miners, software development partners, open source developers, new customers and innovative projects. Because the value of our token is tied to this utility, its value is tied to use of the Cryptyk product, not waivering public sentiment. As more customers subscribe to our product, the value of the tokens in the existing economy grow. Enterprise clients that believe in our product can pre-purchase a reserve of tokens, and watch their investment in our platform stretch, even getting return on their security budget. We asked Bob to comment on how he foresaw the economy benefiting his organization. I’m on advisory boards, and I talk to some of the largest credit unions fighting the same challenges and I tell them ‘I can help you reduce your spend by 50%, reduce your compliance external audit by 50% not only by time but by cost’. And if they run a test with 1000 users, that digital currency will track the value of those additional users. Suddenly you have a reward system that goes beyond what you have invested in the platform today. Every time [other customers] renew with you, I get a little gas, I get a little bit of a reward… we are not only invested in your technology, we are rewarded from it. When you’re rewarded, you are gonna come up with better use cases. This is not going to be a partnership relationship that’s going to die every three years, it’s going to be a very long relationship, and Cryptyk is in return incentivized to understand exactly what their users want the product to be. This is the unique sentiment that our early fans and alliance partners have developed as the Cryptyk vision has grown from a simple storage platform to a rich cyber security economy. Our ambitious goal, often stated during our team meetings, is to become the gold standard of security technology for our customers. We intend to continually grow and deliver a product that goes beyond any expectations. As we ended our interview, Bob had a few words to say about his feelings about the future of Cryptyk as it enters the market. A lot of companies are going to come knocking at your door…never solving real world problems, and just adding more confusion and distraction to what I should be doing. Our purpose is to provide services for [our members] in a cost effective way, and ask ourselves constantly “how do we stay relevant and help reduce the cost that cybersecurity has become today?” Cryptyk understands that, and has said ”we are going to take on the responsibility of holding your most valuable asset. That’s how much we respect your needs, our employees, our work and our product”. That’s exciting to me.